A spear buried on the common border of two nomadic-pastoralist communities in the North Rift region of Kenya marked the end of bloody clashes a couple of decades ago. Today, the two rivals need the churches to help them arrest a fast-growing gun culture. It was about two decades ago when elders of the Pokot and the Samburu, two nomadic-pastoralist communities in the North Rift region of Kenya, buried a spear on the common border in presence of politicians and leaders of other communities. The ceremony was a symbol that all weapons of violence had been buried. As a result, the Pokot and the Samburu lived in peace for years. However, the current proliferation of small arms in the area is posing new challenges to pastoral and humanitarian work. The remote and vast semi-arid region in the Great Rift Valley, in the north-west of Kenya, is occupied by an estimated 1.8 million people. The Pokot, Samburu and Turkana are nomadic pastoralists. The Marakwet are agro-pastoralists. They all live here and historically have clashed over animals, pasture and water. Like other semi-arid parts of Kenya, this one is beset by high poverty levels and illiteracy, with life expectancy ranging from 57 years among the Turkana to 66 among the Marakwet. Churches and non-governmental organizations are the only ones to provide services like education, health and water. "Cattle-rustling is a way of life for these communities, but since 1992, the activity has gone commercial. Then communities acquired guns for raiding and protection," explains Peter Gunja, coordinator of the National Peace Programme at the National Christian Council of Kenya (NCCK). "Some members of the communities realized that with guns, they could raid more cattle and make more money. This is complicating the security in the region." The NCCK together with the Roman Catholic Church and several NGOs are working to end cattle-rustling, poverty, under-development and proliferation of guns in a region where young men, most of them illiterate, sport deadly rifles like AK 47s and G3s on their shoulders. These have been bought for between 7,000 and 20,000 Kenyan Shillings (USD 95-270, Euro 76-216) from neighbouring communities in Sudan, Uganda or Ethiopia, where civil war is either just ending or still raging. With weapons, the traditional practice of raiding animals, admired as a proof of courage, has turned tragic. Local people remember vividly the startling violence of the 1990s. "In response to this situation, the first thing we did was to create peace committees in the temporary villages these nomadic pastoralist communities establish when they find good pastures for their animals," explains Gunja. Composed of opinion leaders, politicians, religious leaders, women and youth, the peace committees link the communities, church groups and NGOs. They mobilize, monitor and report back on the local situation to church and NGO officials. "Local leaders, through the committees, have punished those who perpetrate violence. The communities have resolved the conflicts or handed difficult cases over to the authorities. Now, they are able to resolve them at the grassroots," explains NCCK peace programme officer Carren Kiptoo. "In the past, if an individual person committed a crime, the whole community was blamed for it. Violence would then ensue." The village committees started around 1997 under the NCCK peace programme, and grew into local, and then district peace groups, and finally (since 2002) into a regional peace committee. Their role has ranged from organizing inter-community activities such as prayers and peace mediation meetings, to suggesting community development projects. Fr Francis Moriasi, the vicar general of the Roman Catholic diocese of Eldoret, an important town in the region, cites some positive developments in the committees, but warns the conflict is not yet over. "It is not a one-day conversion. But there are indicators it's happening," he says. As part of its peace project the NCCK is urging the communities to disarm and encouraging local bishops to receive the guns. "Communities so trust churches that they feel freer to give us the guns than to the government. We have collected over 50 automatic and home-made rifles," says Gunja. However, the government is said to be uncomfortable with this, worrying that church leaders are unfamiliar with firearms regulations. According to Selina Korir, from Rural Women Peace Link, a network of grassroots organizations, women are at the centre of peacemaking work in the region, both mediating and creating awareness. "They are able to talk to the warriors and stop an impending raid. They also talk to the elders and educate them on the harm the conflicts are causing," she says. Women have also been carrying out solidarity visits to the hardest hit area, sharing aid with local women and expressing their concerns to elders, political and religious leaders. They also "reverse the norm" by turning traditional songs that praised raiding and violent heroism into peace songs. "If there is anyone who will change the North Rift, it is the women," says Korir. Recently, the local churches through the NCCK started supporting traditional peace initiatives like the Mis or Mumma. 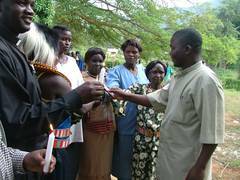 This is a traditional peace oath ceremony between the Pokot and their neighbours. The elders curse anyone who uses a gun to kill his neighbour. Mis involves slaughtering an animal (a bull) so that its blood will cleanse the crime. The animal is then eaten together. "If that is their way of resolving conflicts, we support it," says Gunja, whose programme has funded the purchase of bulls for ceremonies. However, in view of the extreme poverty, church representatives encourage communities to consider selling the bulls and using the money for development projects. Only a small number of these communities have been reached by the Christian gospel, and they continue to worship traditional gods. But the NCCK has been encouraging the churches to drive the gospel deep into the "bush" where the communities live. (*) Fredrick Nzwili is a freelance journalist from Kenya. He is currently a correspondent for Ecumenical News International (ENI) based in the country's capital, Nairobi. The people of Kainuk, a remote township in Kenya's Turkana District, were treated on 21 August to a colourful "beauty and peace contest" organized by the National Christian Council of Kenya through the regional peace committee. As part of on-going peace activities in the North Rift, women from the Pokot and Turkana communities dressed in traditional attire - light brown leather dresses made of goatskin adorned with head-to-toe bead-work and leather shawls - paraded in front of church leaders and community members. After dancing to a melody sung by local Turkana women, three women from each community won the contest. The six winners took home beautiful traditional beads, bracelets, necklaces and "Lesos" (wrap-round cloths treasured by women from these communities).